Gaussian plume and dispersion models are useful tools to derive emissions rates from mobile CH4 measurements as performed within MEMO2. 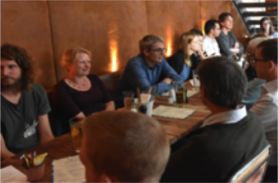 In October 2018, our partner Heidelberg University organised a workshop on this topic to teach theoretical basics on plume dispersion, practice the modelling, and to discuss the measurement strategy for best model use. ESRs are trained to identify and quantify CH4 emissions by monitoring CH4 plumes of major anthropogenic emitters in Europe from mobile platforms such as vans, plains or drones. The measured plumes will be used to derive CH4 emission factors with different dispersion and Gaussian models. 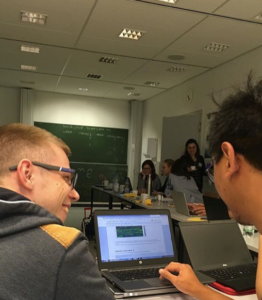 So this workshop was an important part of the training offered within MEMO2 and the ESRs learned how to use simple Gaussian plume models and were made aware of several pitfalls. More complex dispersion models and tracer methods were presented and possibility of exchange of knowledge and accessibility of models were discussed. All students and presenters arrived already the afternoon before the start of the workshop to join a shared dinner, and to catch up and exchange latest news of their project. During the first day, we had three lectures, followed by discussions of the “homework”, which means some preparation exercises to ensure the same level of basic knowledge for all participants and to make fully use of the two workshop days. The exercise refers to real data measured by LSCE. The tracer Acetylene (C2H2) was released at a constant rate and the plumes of methane and acetylene were intercepted multiple times downwind of the source. This exercise focused on the C2H2 measurements only to quantify the C2H2 source using a Gaussian plume model. The solution exercise was discussed than during the workshop. 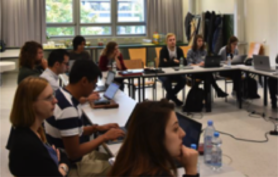 The lectures were given by Dominik Brunner (EMPA), Bill Hirst (Shell), Gregoire Broquet (UVSQ) and Chiel van Heerwaarden (WU), who introduced also more complicated dispersion models. Randulph Morales our ESR from EMPA presented the GRAL/GRAM model and showed the possibility for other ESRs to make use of this model. A second exercise was prepared by Chiel van Heerwaarden and the students had to work in small groups on the solution. 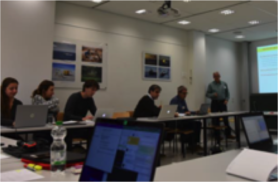 The workshop ended with the identification of important additional measurements in order to improve the use of mobile data in models. Here two aspects had a main focus: synchronisation of all clocks during measurements and the use of a 3-D sonic Anemometer to measure horizontal wind. So the workshop not only showed the basics of Gaussian plume modelling, the outcome will also help to improve our measurement campaigns. 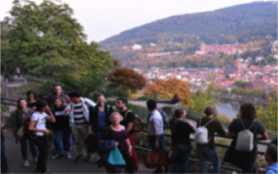 Last but not least: Heidelberg hosts the oldest university of Germany and we took the opportunity to walk along the famous philosophers walk to the Heidelberg old town and had a view of the castle before converging on the typical German restaurant for another enjoyable meal. Evening event philosophers walk with view to the castle and old town. Lunch break on the university campus. Blog written by Sylvia Walter, based on milestone report MS3 by Martina Schmidt, Photos taken by Patryk Łakomiec.